Xinjiang beat Guangdong 117-109 to sweep their opponents 4-0 in the best-of-seven finals and became the sixth champions in CBA history here in Guangdong on Friday. Darius Adams was awarded the finals MVP. 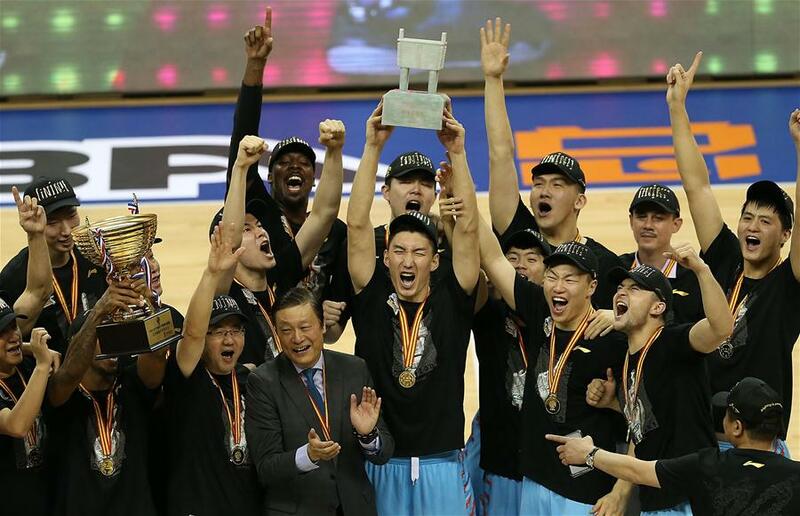 DONGGUAN, China, April 7 (Xinhua) -- Xinjiang beat Guangdong 117-109 to sweep their opponents 4-0 in the best-of-seven finals and became the sixth champions in CBA history here in Guangdong on Friday. Darius Adams was awarded the finals MVP. Xinjiang have lost to Guangdong for three consecutive years in CBA finals since their finals debut in 2008-2009 season. They also suffered a 2-4 defeat against Beijing in 2014. The 2016-2017 regular season champions now became the sixth finals winners of CBA history after Bayi, Shanghai, Guangdong, Beijing and Sichuan. Guangdong clinched the championship title in 2013 to be the biggest winners of CBA with eight titles. Trailed by 0-3 after the previous games, Guangdong started the match 27-17 with strong defense, leading by 10 points into the second quarter. Xinjiang had six turnovers in the first quarter and Adams was forced scoreless by the host's solid defense. Xinjiang stormed 13-2 in the first two and half minutes after the break to take the lead. Guangdong's eight turnovers wasted their lead but Donald Sloan and Zhoupeng's two three-pointers managed to cut the deficit down to 49-53 before the interval. Adams scored 17 of his match-high 37 points to lead Xinjiang outscore Guangdong 36-22 in that quarter. Former NBA player Yi Jianlian was forced to sit on the bench due to his fourth foul in the match, but Carlos Boozer scored 10 points in a row for Guangdong to cut the deficit to as much as only three. Xinjiang then answered with a 10-4 run. By the end of the third quarter, Xinjiang still had a two-digit advantage. The aged Guangdong gradually lost their energy in the last quarter but still cut Xinjiang's lead to only four points with four minutes and 16 seconds to the end of the match. Adams stood out to score five consecutive points. After trying to block Adams's layup, Yi was not able to continue the match and could just step off the court with less than two minutes left on the clock. Another two points of Adams finished the match 117-109. Xinjiang's players ran onto the court to celebrate their victory. "We knew that Guangdong would try their best. As a eight-time champion, they will not easily give up," said Li Qiuping, Xinjiang's head coach. "But we made full preparation for tonight's match. Though we had a slow start and trailed by ten after the first quarter, we just try to catch up with our opponents point by point. We did great job, not only tonight, but also the series and the entire season. The championship is just the perfect reward for the team." With the title, Li became the first coach to win CBA finals with two different clubs. In 2002, he led Shanghai to their first and only title with Yao Ming in the team, who's now the president of Chinese Basketball Association and rewarded Xinjaing with the trophy in tonight's ceremony. The finals MVP Adams had a game-high 37 points for Xinjiang. Zhou Qi, who injured his left thumb in Sunday's Game 2, contributed 18 points and 10 rebounds. Boozer led Guangdong with 28 points and 17 rebounds, Sloan and Zhou Peng respectively had 26 and 22 points, while Yi took only 13 points and six rebounds. Xinjiang's Li Gen, who finished with 11 points, three assists and two steals, became the first player to win titles with two different clubs. He also helped Beijing to win titles in 2014 and 2015. The 4-0 sweep is the second time in CBA history after the league began to use the best-of-seven format in finals since 2006. The previous time happened in 2013, in which Guangdong beat Shandong for their eighth and final title. "We played a tough series, especially after trailing 0-3 in the series," said Guangdong's coach Du Feng. "But we never gave up. We have younger players than our opponents, and the loss is the cost for them to grow up. Actually our plan before the season was just to make into the playoffs. I'm proud of what we achieved now."